The Great Alaskan Earthquake of 28 March 1964 (UTC date - 27 March local date)) generated a great tsunami which was extremely damaging, not only in Alaska, but along Vancouver Island and Northern California. The tsunami waves affected the entire California coastline but were particularly high from Crescent City to Monterey with heights ranging from 2.1 - 6.3 meters (7-21 feet). Eleven persons lost their lives in Crescent City and tsunami damage was estimated at $7,414,000(1964 dollars). The estimated losses elsewhere along California were between $1,500,000 and $2,375,000 (1964 dollars). Extensive damage occurred also in the Los Angeles and Long Beach Harbors. 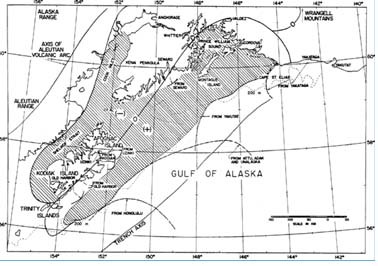 Generating area of the Alaska tsunami. Crosshatched area indicates (-) area of subsidence and (+) area of uplift. Heavy dashed lines indicate the backwards refracted tsunami wave fronts. Solid line marked by a zero is the axis of rotation (no elevation change). Other solid lines are titled as tectonic axes. Santa Cruz Harbor: The waves reached as high as 3.3 meters (11 feet), sinking a hydraulic dredge and a 38 foot cabin cruiser and causing minor damage to the floating docks. San Francisco Bay: Damage in the Bay was largely to pleasure boats. The highest damage was reported from marinas in Marin County where strong currents induced by the tsunami caused boats and floating piers to break loose and strike other craft. Noyo Harbor: Damage was primarily to floating piers and to commercial fishing vessels. Los Angeles and Long Beach Harbors: Some damage occurred in the Los Angeles and Long Beach Harbors. Crescent City: Crescent City, was the hardest hit town. The waves reached as much as 6 meters (20-21 feet) and destroyed half of the waterfront business district. Eleven persons lost their lives. The Crescent City Harbor is one of the oldest in California. Lumbering and timber products are the major industries. Four waves struck the city. The travel time of the first tsunami wave to Crescent City was 4.1 hrs after the occurrence of the earthquake in Alaska. It caused no significant damage other than flooding. The second and third waves were smaller than the first. The fourth was the largest of the waves with a height of approximately 20 to 21 feet. It was preceded by a withdrawal of the water which left the inner harbor almost dry. This fast moving fourth wave capsized 15 fishing boats. Three other boats disappeared, and eight more sunk in the mooring area. Several other boats were washed onto the beach. Extensive damage was inflicted to the piers. Aerial photo of Front and G. Streets of Crescent City, two days after the 1964 tsunami from Alaska struck, showing the destruction and displacement of buildings. The tsunami waves covered the entire length of Front Street, and about thirty blocks of Crescent City were devastated. Lumber, automobiles, and other objects carried by the waves were responsible for a good portion of the damage to the buildings in the area. Fires started when the largest tsunami wave picked up a gasoline tank truck and slammed it against electrical wires. The fire spread quickly to the Texaco tank farm, which burned for three days. Final tsunami damage in Crescent City was estimated at $7,414,000. (1964 dollars). COX, D.C. and Pararas-Carayannis, G. 1969. A Catalog of Tsunamis in Alaska. World Data Center A- Tsunami Report, No. 2, 1969. IIDA, K., D.C. Cox, and Pararas--Carayannis, G. 1967. Preliminary Catalog of Tsunamis Occurring in the Pacific Ocean. Data Report No. 5. Honolulu: Hawaii Inst.Geophys.Aug. 1967. PARARAS-CARAYANNIS George, 2001. THE BIG ONE - The Next Great California Earthquake, Aston-Forbes Press, 375pp.